A small library could be stocked with books written about Napoleon Bonaparte the general, whose battles and campaigns have been studied extensively. Warriors, however, are not generally known for their diplomatic skills and Napoleon is no exception. After all, conquerors are accustomed to imposing rather than negotiating terms. For Napoleon, however, the arts of war and diplomacy meshed. Napoleon was often as brilliant and successful at diplomacy as he was at war, although at times he could also be as disastrous at the diplomatic table as he was on his final battlefield. William R. Nester’s Napoleon and the Art of Diplomacy is the first comprehensive exploration of Napoleon the diplomat and how his abilities in that arena shaped his military campaigns and the rise and fall of the French empire. Napoleon’s official diplomatic career lasted nearly two decades and involved relations with scores of kings, queens, ministers, diplomats, and secret agents across Europe and beyond. All those involved asserted their respective state (and often their private) interests across the entire span of international relations in which conflicts over trade and marriage were often inseparable from war and peace. For Napoleon, war and diplomacy were indivisible and complementary for victory. Much of Napoleon’s military success was built upon a foundation of alliances and treaties. Although not always at war, Napoleon incessantly practiced diplomacy on a steady stream of international issues. Some of his noteworthy achievements in this arena included his 1797 Treaty of Campo Formio with the Austrians after he defeated them in the Italian campaign; the 1807 Treaty of Tilsit, when he incorporated Tsar Alexander of Russia as his junior partner while France was still at war with Britain; and, the 1812 conference of Dresden, where the crowned heads of Europe allied with France as Napoleon opened his massive (and disastrous) invasion of Russia. 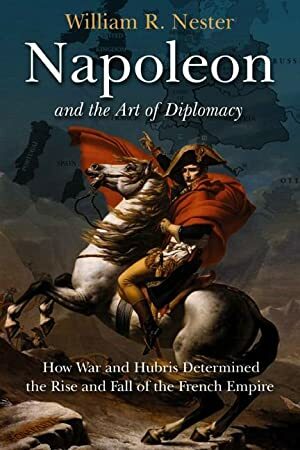 Nester’s masterfully researched and written Napoleon and the Art of Diplomacy fills a gaping hole in Napoleonic literature by providing a vital and heretofore neglected dimension that allows readers to fully understand one of history’s most intriguing, complex, and powerful leaders. About the Author: Dr. William Nester is a professor in the Department of Government and Politics at St. John’s University in New York and the author of more than a score of books on a wide variety of international relations topics including The First Global War: Britain, France, and the Fate of North America, 1756-1775 and Haughty Conquerors: Amherst and the Great Indian Uprising of 1763. He has spent nearly a dozen years living overseas doing research and traveling in more than eighty countries. Dr. William Nester is a professor in the Department of Government and Politics at St. John’s University in New York and the author of more than a score of books on a wide variety of international relations topics including The First Global War: Britain, France, and the Fate of North America, 1756-1775 and Haughty Conquerors: Amherst and the Great Indian Uprising of 1763. He has spent nearly a dozen years living overseas doing research and traveling in more than eighty countries.